SAN FRANCISCO, March 9, 2017 /PRNewswire/ -- Three months after its acquisition of Virgin America, Alaska Airlines is growing its Bay Area footprint, adding 13 new nonstop markets from San Francisco International Airport and Mineta San Jose International Airport. The routes mark the single largest new market announcement in Alaska Airlines history. With the additional flights, Alaska Airlines and Virgin America will offer guests 125 daily nonstop flights to 42 destinations from the three major Bay Area airports. "The 10 new San Francisco routes and three new San Jose routes offer something for both the leisure and business traveler, including exciting destinations like New Orleans, Baltimore, Austin and Kona, Hawaii," said Andrew Harrison, executive vice president and chief commercial officer at Alaska Airlines. "Our strategy is to use the same philosophy that's worked well for us in our Pacific Northwest hubs, which is to offer convenient, nonstop flights to the places guests fly to most. And if your itinerary requires travel overseas, our 10 global airline partners offer 137 international departures a week from the Bay Area." "With this announcement, Alaska and Virgin America have demonstrated their continued commitment to the San Francisco Bay Area," said Ivar Satero, San Francisco International Airport director. "Like both of these great airlines, we have a passion for creating exceptional travel experiences, and we are thrilled that our guests can now enjoy more destinations from Alaska and Virgin America." 6:30 a.m., 10:50 a.m., 2:39 p.m., 6:55 p.m.
8:03 a.m., 12:25 p.m., 4:12 p.m., 8:28 p.m.
8:45 a.m., 1:05 p.m., 4:52 p.m., 9:20 p.m.
10:08 a.m., 2:30 p.m., 6:15 p.m., 10:44 p.m.
*Note: Service between San Francisco and Mexico City will begin later this year, pending government approval. Flight times based on local time zones. To bring the excitement of these new destinations to travelers – quite literally, Alaska is launching a social media promotion today to deliver on-demand, destination inspired food items and free flights to Bay Area residents. Travelers who tweet the airlines at @AlaskaAir and @VirginAmerica using the hashtag #MostWestCoast and with an airplane emoji will score the chance to have a destination-specific treat (think BBQ for Nashville and beignets for New Orleans) delivered within a few hours to their front door. The airlines are planning more than 900 deliveries today – and 10 lucky travelers will also score a free flight to one of the new destinations. More details will be announced at 11 a.m. Pacific time on the airlines' Twitter handles. Editor's note: High-definition, broadcast quality footage of Alaska Airlines and Virgin America is available for download at https://ascorpcomm.sharefile.com/d-sadfdde4d49545f4a. 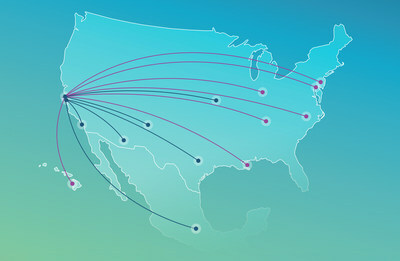 Alaska Airlines and Virgin America along with their regional partners, fly 40 million customers a year to 118 destinations with an average of 1,200 daily flights across the United States and to Mexico, Canada, Costa Rica and Cuba. With Alaska and Alaska's global partners, customers can earn and redeem miles on flights to nearly 900 destinations in the U.S. and worldwide. Learn more about Alaska's award-winning service and unmatched reliability at newsroom.alaskaair.com and blog.alaskaair.com. Alaska Airlines, Virgin America and Horizon Air are subsidiaries of Alaska Air Group (NYSE: ALK).